There's this vintage mason jar sitting in the open shelving in the kitchen with popsicle sticks in it. Behind it is a milk glass planter with more popsicle sticks. In front of it there's a scrabble tray with another popsicle stick on it. That stick on the scrabble tray says, "Craft." We've had quite a few people ask what this whole "popsicle stick obsession" is all about. It does look a little odd, I suppose. Well, we call it "The Dating Jar." For the last two years we've had a weekly "date" night, usually Monday nights. But just like anyone balancing work, church, homeschooling, four kiddos, etc., we would get so busy, and pretty much forget about our "date." "Uuum, what do you want to do?" It was annoying. And frustrating. We'd "set aside" this time to spend together, yet we hardly ever planned anything. Sadly, the "Date Night" we wanted to look forward to spending together just wasn't happening. 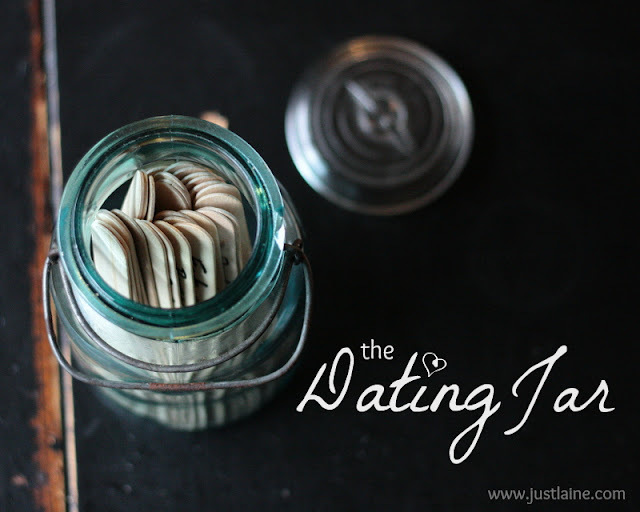 Inspired by this post from Heather at Thrifty Stories, we used a Monday date night to make "The Dating Jar." Using popsicle sticks and a sharpie we began to write down every fun thing we could think of. Ya'll, my hubby was full of good ideas, he put me to shame! I only came up with about 1/4 of the ideas! Most of our "dates" are stay at home ideas because let's face it, it's just hard to get a babysitter every week! Plus going out every week can get expensive. I thought it might help you out to see what's in our dating jar. We didn't set a number of sticks that we wanted for the jar, we just wrote until we couldn't think of anything else. But as we think of new date ideas, we add them to the jar! Here are our "rules" for the dating jar. 2. We take turns "hosting" it. This basically means that if it's my week to host and there is a babysitter needed, or a certain food, than it's my responsibility to take care of that. 3. We put the "date stick" on an extra scrabble tile holder where it's displayed. Being reminded of it every day and looking forward to it is my favorite part! 4. After our date, we move the stick over to the milkglass planter and then pick another from the jar for next week, and the anticipation starts all over again! If you aren't regularly dating your hubby, you NEED to. It's so important...doesn't matter if you've been married 6 months, 10+ years (like us!) or 25 years...spending time together on purpose will keep you together. We had great plans to make pallet art this week since we were supposed to do a craft together, but with sick kiddos, that was NOT happening. So last night we just sat our tired selves in bed and learned to finger knit together, lol. Now we have yards of finger knit garland draped across the dining room curtains. =D It really isn't all about what you do, just have fun together! Now go ahead, grab yourself a bag of crafting popsicle sticks next time you're out and make a dating jar. You'll be SO glad you did! What do you and your hubby do to spend time together? Do you have regular "date nights?" Have any fabulous "stay-at-home" date ideas? I'd love some new ideas for our jar! Laine, I love this idea!!! What a great way to make "home dates" more fun and special! Thanks, Christa! It is a whole lot more fun this way! I am inspired! Josh and I need this. Esp getting it into our heads that we don't always have to go out for our date night. Do you put your kids to bed first and if so, what time do your kids go to bed? Josh usually goes to bed early because he leaves for work at 4:45, but a date night before his day off would work. Love this! Have been thinking of date ideas, now I just need the sticks! Hey...thanks for the mention. ;) I will definitely be adding some of your date ideas to our jar. Love them. Dutch blitz is awesome!! I grew up with it too...I have fond memories of my parents having all night dutch blitz "tournaments" with their best friends, and my siblings and all their kids would just have a blast too! So fun. ;) More people need to know about that game! wondering when you do this too. I have 3 kiddos living with us right now and trying to figure out how to fit "us" time in. I wanted to do this date night jar idea too after seeing Heather's post but then things happened with the kids and I wasn't sure how I could make it work. You can definitely make it work! You can see my reply to Alicia, but after they go to bed would be the best time. We end up a bit tired the next day because we usually stay up too late, but it's worth it. =) I think our favorite thing about it is that a date is already thought up and "planned for us!" Hi ! I came along your blog while googling chalkboard paint... I read your school room post and I was wondering if you could share how you made the 8$ chalkboard in your dining room? Thank you! Totally gonna do this!!!!! !